It’s been a great day – we sailed past our target of 1 million clicks in 100 hours late this Saturday morning. The site became a little sluggish as the couter got closer and closer to the 1 million mark, probably because everyone was hitting the refresh button (I know I was!). Anyway, we made it and with plenty of time to spare. We’ll keep the Zoonometer™ until the end of the 100 hours to see how far we get – my bet is for something close to 1.5 million. The Zooite to make the 1 millionth click was jdavenport. 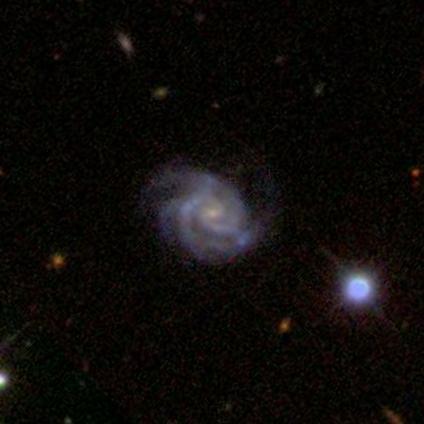 jdavenport joined Galaxy Zoo back in August 2008 when the original Galaxy Zoo was still active. jdavenport has also classified a serious number of galaxies: 531! Thanks jdavenport for all of your help with Galaxy Zoo and thanks to all of you for helping us achieve 1 million clicks in (less than) 100 hours! Fantastic news – GZ ROCKS! Great work everyone and hi5 to Jdavenport for the million! I say the graphic for the thermometer needs to break at the top and shoot out orange-redish color all over the place. Since the clicks are way ahead of schedule, what about a million galaxies? can u make classification counter in classifying page so i could track myself easier. Fireworks would seriously interfere with the classifying – back to work, the lot of you. Mark – I agree with the zoonometer – or else it should expand! Now who’s going to help me classify the rest? A beautiful galaxy for a great moment! If only we could keep up this pace 🙂 A big thank you to everyone who made the count go up over the last 100 hours and especially to the people at NEMO (Amsterdam, the Netherlands), both who made it all possible and the thousands of visitors that dived behind the computers to go and give it a try. Tip of the old hat to Jdavenport for the hitting the million milestone and another tip of the hat to all the other participants that put the numbers where they are. CONGRATS to all who helped for the million mark! Since you’re keeping the thermometer up, is there any chance you can set it to the current grand total of all the clicks since the beginning of Zoo 2? Congrats to jdavenport, now a thought…I don’t know if anyone here has read Mr. John Sandford’s (this isn’t his real name it’s John something else) Prey books. It’s a serie of 15 (from last count) books featuring a Minnesota cop named Lucas Davenport, so I was wondering when I read jdavenport and it reminded me of the series (I’m currently starting to read Invisible Prey, the one before last in the series. The other is Phanton Prey). It’s a pretty good series, it has lots of action and yeah a little bit of stuff not for kids under 18, but other than that it’s awesome. Sorry for writing all this stuff that has nothing to do with GZ, my apologies. What was the total for the whole 100 hours? Have you taught your 5 month old son to classify yet? Great result. I was quite proud of us all. By the way does anyone have a screen capture of the Zootometer final total at the 100 hour? I’d like to add it to my blog post. Thanks. i am so pleased that the millionth galaxy was a triple!